It all started with a dream of a father and son together building affordable homes without negating quality. Together, they have over 40 years of experience in the construction industry. Being family-owned and operated, we put our name on every home we build. We build with pride and precision craftsmanship, blending timeless design, highly functional floor plans, and the latest lifestyle amenities to provide you with an exceptional living environment. This family pride is evident during each step of construction. We enjoy long-term industry relationships with leading designers, suppliers and loyal contractors that have been strengthened over the years by our focus on product and business ethics. We also enjoy long relationships with our customers. Potential homeowners can choose from an existing plan, modify a design or custom design/build to suite their lifestyle. 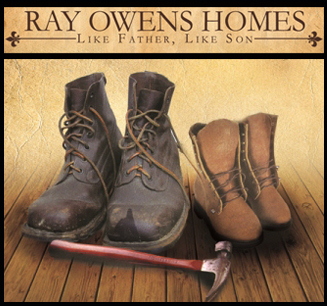 As a builder located in Edmond, Oklahoma, Ray Owens Homes, LLC gives its customers innovation and flexibility in design. Design, location, and consideration for your tastes and lifestyle all work together with equal importance. We handle your entire project with care, from site selection, through design, to financing. We extend an invitation to those of you who are looking for a new home…you can be assured that we have the expertise to do the job. Buying a home is probably the largest financial commitment that you will ever make; therefore, your choice of a homebuilder is very important. Beginning with your first visit and continuing through customer service after you move in, we will do everything we can to make your home buying experience a pleasure.